Jeff is coming from the rock business. The title is a warning to his friends, who might have expected a rock album. As you can see on the front cover of his album he is a drummer, but he also plays keyboards and guitar. He has written, recorded and produced this album. In conclusion a self-made album, but a good one. 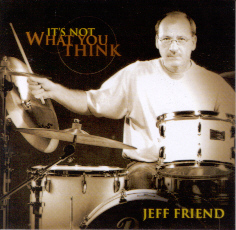 Jeff's new album "It's Not What You Think" (2003) starts in the middle of modern life, just in a city traffic. Too Many Cars is Jeff's musical sigh. The horns of cars are disturbing his nerves and Jeff can mediate this feeling. Kinda Like Bob is dedicated to Jeff's favorite jazz musician Bob James. One of those musicians all smooth jazz fans know. Jeff tried to capture the spirit of Bob James' music of the seventies/early eighties. I especially like the organ part. My first impression of Biahya was: "Sounds like Pat Matheny". I am deep impressed by Jeff's professionalism and versatility. He plays all instruments on this track. Keyboards, drums, percussion, guitar and all perfectly arranged. "Somehow it stuck", is Jeff's comment and I can really agree. Smoothie is Jeff's trial to interpret Sade's music with a sensitive artistic understanding. Matt Warner (sax) and Bruce Clingan (trumpet) are adding some brass to this groove song. And The Rain Falls is featuring Matt Warner again. I was wondering when the drummer Jeff would start his first solo. Here it is. The CopyCat is the music on smooth jazz radio we are used to listen to. Sammy Peralta's "Kiln" was Jeff's reference for this song. By the way the name isn't used because this is a copy of a song. Jeff's comment: "This song was written after I attended a seminar on graphic design. The speaker (Jason Moore who did the graphic design for the CD), was talking about how in art school, whenever he turned in a project, he always had to include a reference. A photo, a piece of art, or something that he used to get the idea for his project. It started me thinking about how in advertising, most of what you see are copycat ideas". The title song It's Not What You Think is a fine fusion of smooth jazz and some rock elements. Jeff's guitar is rocking. "This song just wanted to rock", is Jeff's explanation. Sax, trumpet and Jeff's vocals are giving this song the necessary "jazz feeling". Jeff's album is a fine smooth jazz project. Unfortunately it is with a time of play of 26:51 minutes rather short.